Use the lime pieces to rub the cavity and outside of each fish then rinse off and pat dry. Use a knife and slash each fish (not too deep) both sides diagonally then use your hands to generously apply the seafood seasoning to the cavity and all over the outside of the fish. I used roughly just over 1 tbsp of seasoning and set aside. 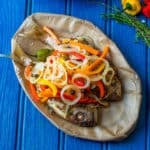 Melt 1/3 cup of coconut oil on medium heat in a large skillet then add the fish and proceed to fry the fish for 4-5 minutes per side until crispy (larger fish will take longer to cook through, see post). Prepare the escovitch sauce by adding the bell peppers, carrot and onion to the oil on medium heat (add more oil if needed to make 1/3 cup worth). Saute the vegetables until translucent then stir in the vinegar, pimento, thyme and coconut sugar. Increase the heat to high for 1 minute then reduce to low and over the pan with a lid before allowing the vegetables to steam for 5 minutes. Serve by topping the fish with the pickled vegetables.